Mister M & One87 created a top quality Drum ‘n’ Bass event called Star Warz. Over the past 12 years it blew up to one of the finest Drum ‘n’ Bass concepts the world has ever seen. A combination of quality line ups, great artwork, a top class venue and a heavyweight sound-system is at the base of its huge success. Star Warz’ reputation soon spread through the highest circles of the Drum ‘n’ Bass scene and Star Warz is constantly chosen as host for label nights and B-days by all leading players as Critical Records, Renegade Hardware,Shogun Audio and several Metalheadz nights to name but a few. 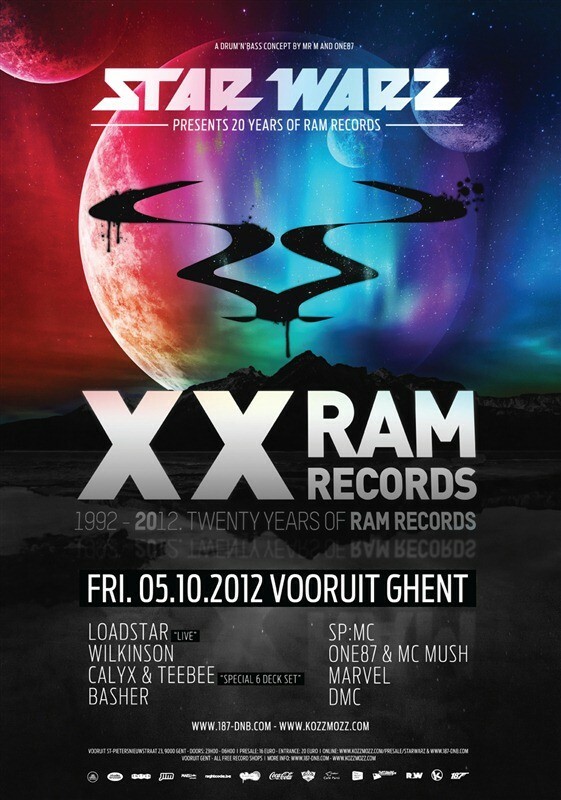 This time, we will be celebrating the 20th anniversary of Ram Records (and co-incidentally also the 20th anniversary of Star Warz founder One87’s dj-career, who has been following Ram from the very beginning). As you all know, Ram is the label of the legendary Andy C. He did not only create many pivotal releases himself but has been unlocking the potential of lots of great but formerly unknown artists since. Ram Records is a multi award winning organization, not only for its label activities but also the music it releases and the many artists it has signed over the years. As well as Ram's musical output, the label is also very well known for its legendary club nights. This all started at the infamous 'The End' nightclub and lasted 11 years till the clubs closure. Moving on from The End to super-club Matter saw Ram's attendees triple from 1000 to well over 3000 people within 2 months. Now Ram is proud to call Fabric its London home. Ram has sell-out roadblock sessions every 2 months at this institution as well as one off events all over the world. And here’s one of these one off events with some of Ram newest and finest talents. Formerly known as Xample and Lomax, this duo’s incredible new musical direction coupled with the backing of Ram Records ensured that Loadstar’s path to the highest echelons of the scene was assured. Loadstar is undoubtedly spearheading the bass music revolution today and will bring an exclusive live-set. They will be joined by Ram Records’ newer signings, Wilkinson. He first appeared on Andy C’s Nightlife 5 album (with three tracks!) in 2010 and was proclaimed ʻBest Breakthrough Producerʼ award at the National D&B Awards earlier this year. After remix work for Chase & Status, Nero, Professor Green and more, he is the guy to watch out for as is his soon to be released debut album for Ram. Calyx and Teebee met as label mates at Moving Shadow ages ago. Many releases and gigs followed till they decided to join forces and it proved a big success. Their first collaborations appeared on Calyx’ debut album, the follow-ups on Teebee’s renowned Subtitle label. And then ‘The Anatomy EP’ followed which was so good they got picked up by Ram for whom they are now working on an album. They will bring you an exclusive “6 deck dj set”, so watch out ! London’s Basher is another one of those exceptional talents that caught the ear of Andy C who picked him up for Ram. He also remixed big names as E-Z Rollers and Cause for Concern and recently launched his own imprint, Proximity Recordings. Add to that Belgian talent James Marvel from Ammunition fame and resident One87 who will be teaming up with MC Mush from Steam and SP:MC and DMC for fluid vocals throughout the night and you know you will be hyped up to the max ! Another steaming edition of Star Warz coming your way!